Nantahala River Lodge, a unique riverfront, pet friendly cabin near Bryson City. Our 3 bedroom cabin by the river offers the best in Nantahala Lodging and is perfect for Families, Friends and Fishermen. We custom designed and built our Nantahala River Lodge with reclaimed wood from our family’s North Carolina cabins and barn. Native stone was used inside and out. We furnished our home with handcrafted furniture and transformed family heirlooms into art. Every detail was carefully considered as we blended our family history into the creation of the Nantahala River Lodge. The Lodge offers accommodations for up to 8 people. Every room offers a view of the river. We encourage you to open the windows to bring the soothing river sounds indoors. Browse our website, check our availability calendar and secure the most wonderful time you can imagine at the Nantahala River Lodge. 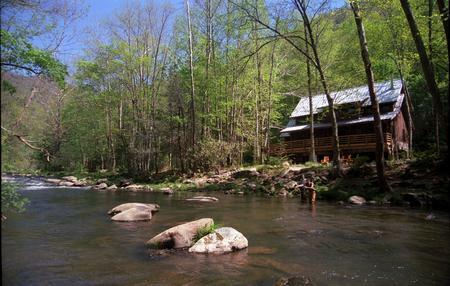 Nantahala River Lodge was featured in the New York Times ! Escapes, Great Homes and Destinations section.